21 Best Stranger Things T-Shirts: The Ultimate List (2019) | Nerd Much? If you’re a fan of Stranger Things, then this list is for you. If you haven’t seen the series yet, well… What are you doing? Go binge watch it on Netflix and then come back. we’ll wait. Whether you only recently discovered the show or jumped on the bandwagon early, we’re here to help you assuage your longing for Season 3 with these awesome graphic tees. These comfy, versatile Stranger Things T-shirts are the basis of any nerd’s wardrobe. They are there when you need them to go the extra mile in promoting all your favorite fandoms, and if you know where to look, the artwork is absolutely incredible. This list will contain spoilers for Stranger Things Season 2. You’ve been warned. There’s really nothing better than sitting around the table with some of your best friends, some snacks, and the threat of a raging Owlbear. 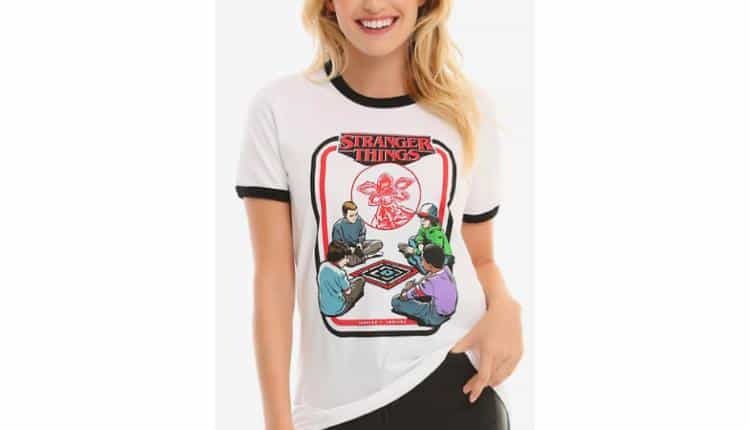 Now you can show your love of board games and Stranger Things with this women’s t-shirt from Box Lunch. This 100% cotton t-shirt is available from sizes XS to 2X. Black cuffs around the neck and arms reinforce the hems and make the shirt look sharp. 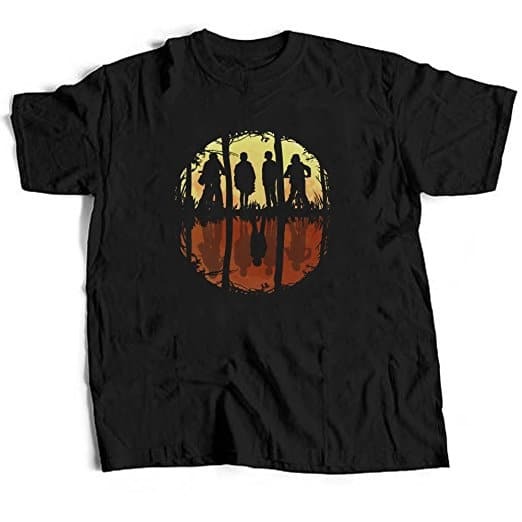 The shirt features the Party from Stranger Things, including Eleven, Mike, Dustin and Lucas all huddled around a board game (or dungeon map?) Above them in red is a Demogorgon relief, and the whole scene is bordered by a black and red frame. The Stranger Things title is emblazoned just below the collar, just in case anybody doesn’t get the reference. 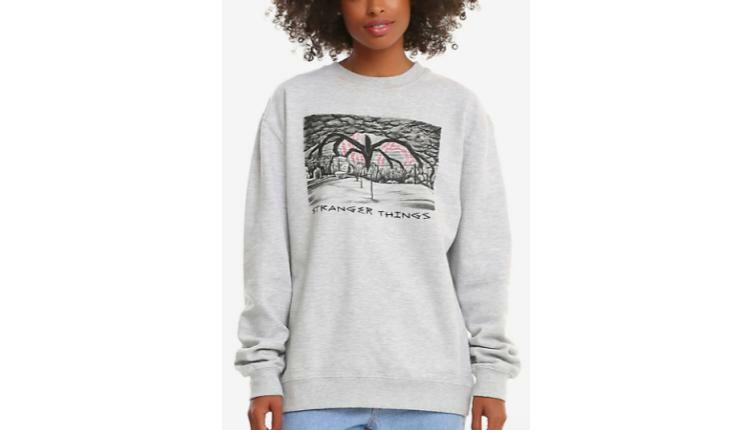 Cozy up in this super comfy sweatshirt, featuring Will’s sketch of the Shadow Monster from Season 2. This poly-cotton blend is perfect for binge-watching Netflix or late-night D&D sessions. The decadently long sleeves and waist length provide optimal snuggling. The shirt is available in M to 2XL – Small sizes are unavailable at the moment, but they should be back soon! Will’s sketch depicts the behemoth Shadow Monster looming ominously over a barren Indiana landscape, with red lightning dramatically crashing behind him. The scene reflects Will’s visions in the early episodes of Season 2, just as he drew them whilst himself being drawn to the Monster through his connection to the Upside Down. Who doesn’t love Dustin, and that ridiculous purring noise he makes? 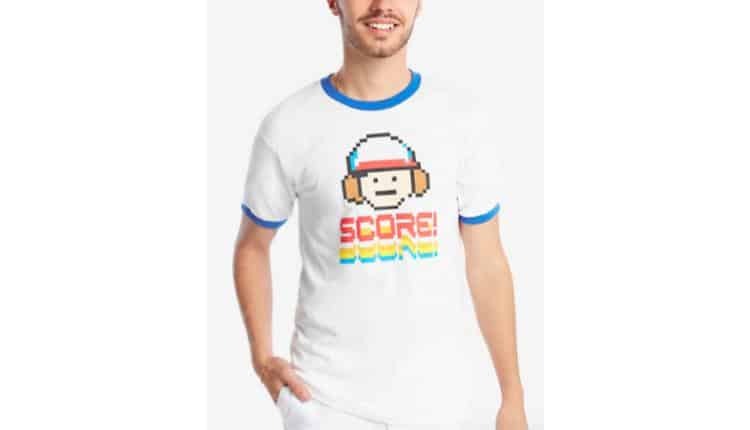 Relive your retro gaming days with this awesome men’s tee depicting the face of a pixelated Dustin in all his technicolor glory. This white poly-cotton blend features a band of bright blue around the collar and arms, which ties in with the colourful print. These shirts are available in men’s sizes XS to XXL, and are only available on Box Lunch! If you enjoy retro games and Stranger Things, this is the perfect amalgamation to score a level up and reach prime nerd potential! 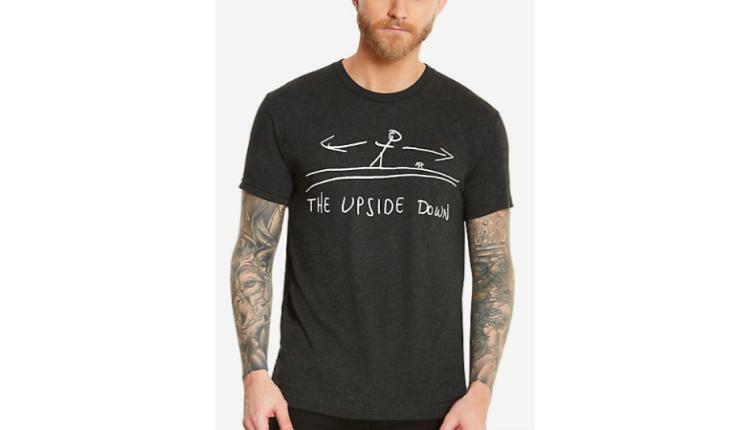 Open your curiosity door wide with this the Upside Down illustrated tee. The design is based upon the rough sketch done by Mr. Clarke when explaining how the Upside Down theoretically worked, and how somebody could theoretically get into the upside down, or exist there at all during Season 1, Episode 5: The Flea and the Acrobat. Using this illustration, Mr. Clarke explained how in or dimension, we are like an Acrobat on a tightrope, and we are restricted by rules – we can only go forwards or backward along the tightrope. However, a Flea on the same tightrope has more options; that Flea can go forward, backward, or even walk along the underside of the tightrope. The Flea can access the Upside Down, theoretically, because its rules and restrictions differ from the Acrobat’s. It was a really fantastic way to simplistically explain multiverse theory, so kudos to Mr. Clarke. These poly-cotton blend shirts are typically available between XS and 2XL, although at the time that this article is being written, only size SM is available. There will surely be more to come, though, so never fear! Rule 1: Always keep the curtains drawn. Rule 2: Only open the door if you hear my secret knock. Rule 3: Never go outside alone, especially not in the daylight. Three rules, that’s it. Instead of writing them on your forehead, as Hopper likely wanted to very much do to Eleven, how about you just wear a shirt that lists them instead? At the beginning of Season 2, we were all relieved to see that Eleven was alright. There were hints that Hopper was taking care of her at the end of the first season, but honestly, it was up in the air until we saw her settle down to breakfast with him in Season 2. The conditions of his care, however, were rather strict. Jim Hopper had three rules that Eleven needed to follow, in order to keep her safe. Unfortunately, cooping up a supernatural teenager in a cabin in the woods who’s dearly missing her friends is easier said than done. This Stranger Things t-shirt is listed in junior sizes, but don’t let that deter you from getting it! 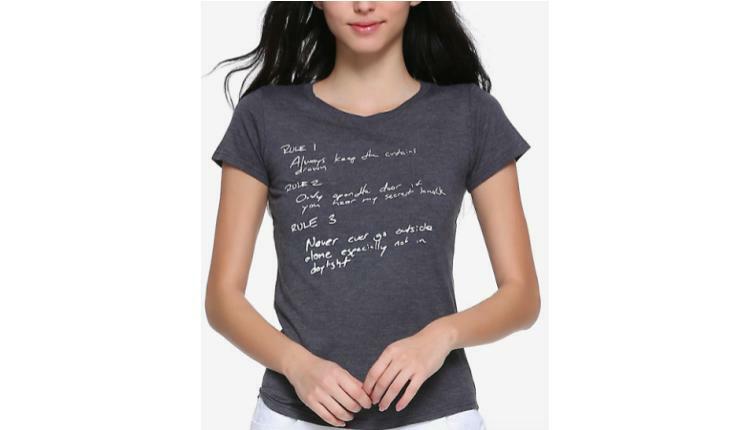 Available in sizes XS through until 2XL, this poly-cotton blend shirt features a caricature of Hopper’s scrawling handwriting in white on a slate grey background. There isn’t really anything more iconically Stranger Things than Joyce Byers’ Christmas lights strung up throughout the Byers household in Season 1 to communicate with Will in the Upside Down. Joyce used her cornucopia of festive holiday lights created a makeshift ouija board out of her living room wall. This clever application made it possible to communicate and fuelled the belief that her son was alive, in spite of everyone else thinking she was crazed with bereavement. Now you can wear the Christmas Light alphabet (though if it starts lighting up, you may have a problem). This poly-cotton blend shirt is available in sizes XS through until 2X, and features black hemming around the collar and sleeves for extra durability. We included the Prince of Demons in our list of 21 Super Cool Nerdy Jackets post, but we understand if you’re more of a t-shirt person. 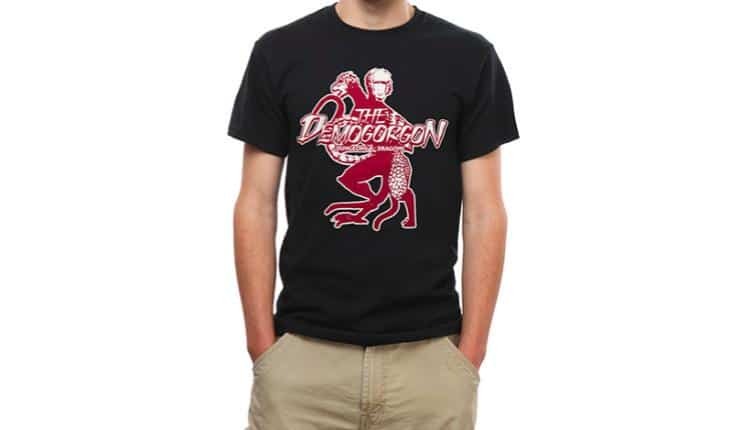 Now, you too can sport the Demogorgon with this awesome tee by ThinkGeek. The Stranger Things t-shirt features the classic illustration of this feared beast on a black or heather grey background. The shirt is presently only available in 2X or 3X sizes, however, we’re sure there’ll be a stock-up soon. Of course, the Demogorgon has been famous among nerds long before Stranger Things. Considered to be “the embodiment of chaos, madness, and destruction,” it made its debut as one of two Demon Lords in the 1976 edition of Dungeons & Dragons. This denizen of chaos has maintained its infamy straight through until the most recent 5th edition of the game, featuring as a potential opponent once more in the Out of the Abyss adventure. Beyond the first season, these three words have been flung around between the characters as reminders, retributions, and promises, and count as one of the overarching themes of the show. 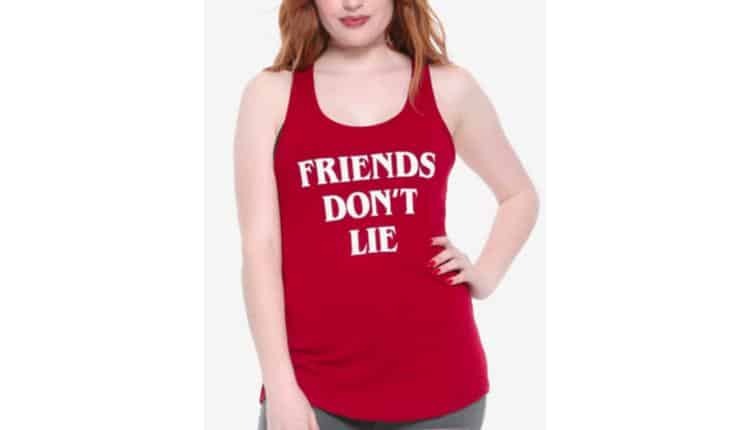 Now, you too can maintain this oath by sporting this bright red racerback tank from Hot Topic. The tank top comes in sizes XS through 3XL, and although it’s listed in junior sizes on the website, we’re sure you’ll like what you see. Despite the controversy surrounding the introduction of Kali (aka “Eight”) in Season 2, you can’t tell us that you didn’t giggle when Eleven went through her “rebellious teenage phase” and showed up wearing eyeliner and started saying things like “bitchin’.” It also supplied an incredibly cute scene when she and Hopper had their reconnecting moment in his cruiser. Relive your own rebellious teenage years with this 80’s inspired portrait tee by Hot Topic. This cotton shirt is typically available between XS and 3XL sizes, and features a high-contrast black and white portrait of “Rebellious Eleven”, with her hilarious catchphrase scrawled along the bottom in pink cursive on a black background. 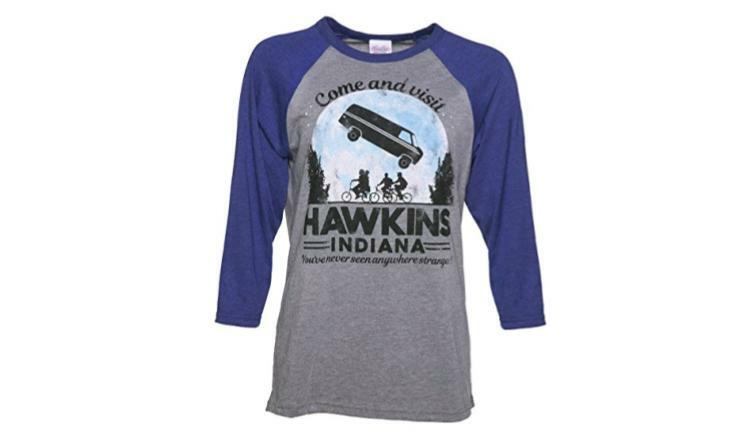 Show your support for the folks over at Hawkins PD by wearing this fantastic blue tee from Hot Topic. Step into Hopper’s well-worn shoes and show that you can lead the team. You may even be able to get on Florence’s good side if you show up with an apple instead of a cigarette. 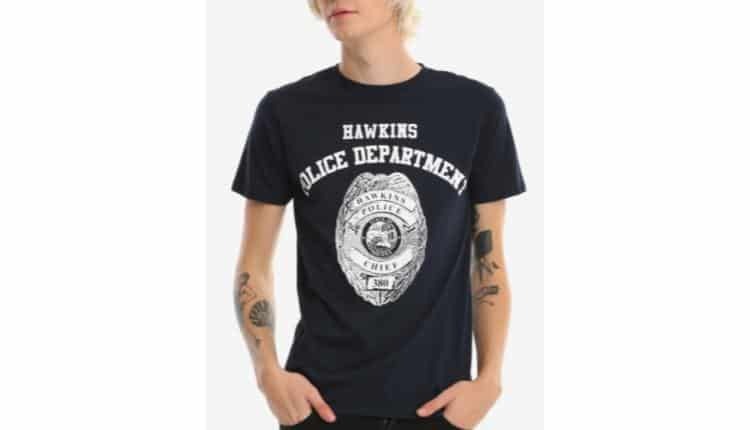 This shirt features an intricate white police chief badge, with the words “Hawkins Police Department” emblazoned across the chest, all on a dark blue background. It’s made out of 100% cotton and comes in sizes ranging between XXS and 3XL. Feeling dark and not at a little badass? 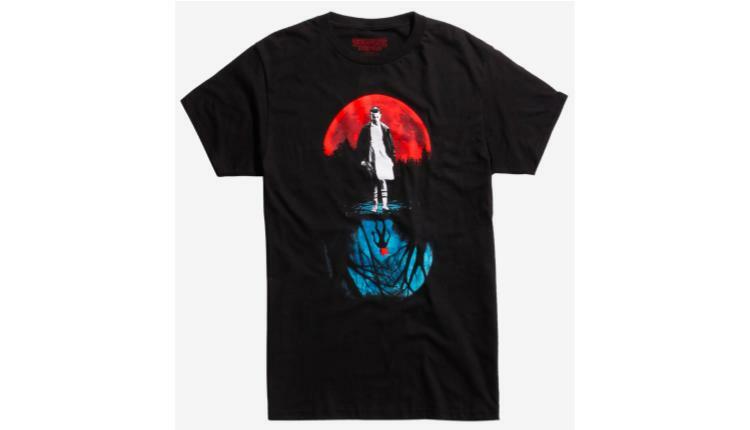 Check out this Stranger Things Eleven Moon T-Shirt, currently available at Hot Topic. This shirt comes only in black, all the better to make the art on the front stand out. Here we see Eleven doing her murder walk against a blood-red moon and trees in the background. Below her feet is the upside-down, where a Demogorgon awaits, red mouth open and lit by a blue moon instead. 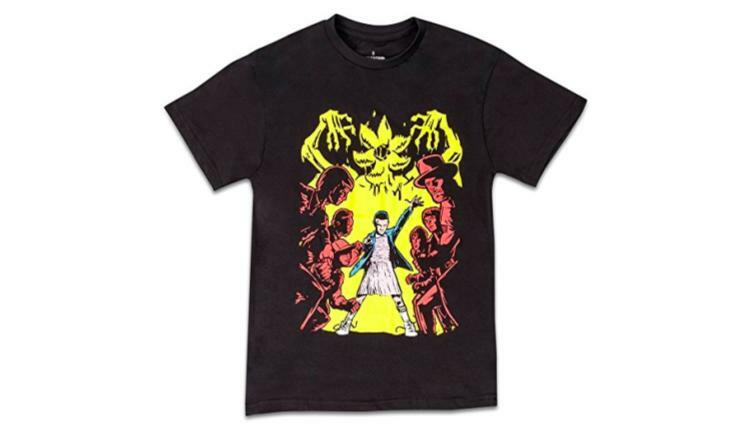 Though only a mere shirt, this art encapsulates Eleven’s character by the end of Season 1 perfectly. She is going to save her new friends, no matter the cost – the Demogorgons and lab technicians only stand in her way. This shirt is currently on sale for 20% off. However, keep in mind that the price changes depending on which size you pick. At the sale price, a small is $16.72 USD, 2X is $18.32 USD, and 3X is $19.92 USD. 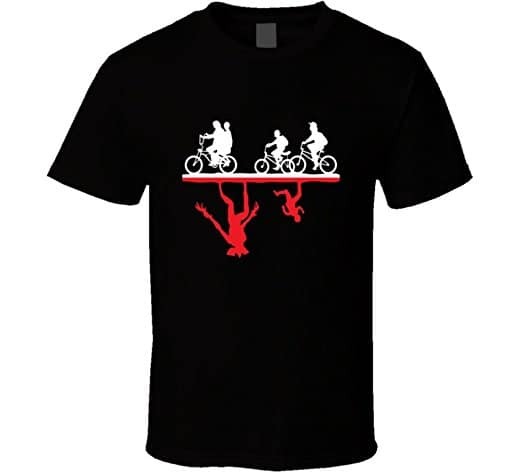 Run for your life with this Stranger Things Upside Down T-Shirt. Available at Amazon and made of 100% apparently “preshrunk” cotton. Don’t take their word for it though, and make sure you anticipate a little shrinkage. What really makes this shirt one of a kind is the iconic silhouette of the main characters from Stranger Things. In white we see Dustin, Mike, Lucas, and Eleven, riding on their bicycles. Eleven is riding with Mike, of course. In red we see the Upside Down and a Demogorgon chasing poor Will. This art speaks to Season 1 of Stranger Things, as Will was rescued and living a normal life top-side in the second season. That is not to say Demogorgons and the Upside Down did not feature in Season 2, they very much did. The price of this shirt ranges from $19.99 USD to $21.99 USD, depending on which size you pick. Nothing like a baseball-themed t-shirt to really advertise tourism in Hawkins, that’s for sure! Or is that the place where a kid with telekinetic abilities lives? Joking aside, this shirt has blue 3/4 length sleeves, a pale grey torso, and a large print at the center. The faded quality of the letters and picture lend to the overall feel of the show. Set in the 80s, Stranger Things is a mix of nostalgia and an update on the horror genre Stephen King was so famous for at the time. If Stranger Things hit you right in the nostalgia, or you just love old cassette tapes as much as Dean Winchester, this Hawkins Middle School AV Club Shirt is for you. Modeled after grade school club t-shirts, this shirt has Hawkins’ school logo at the top, an old cassette tape outlined at the center, the date 1983 around it, and A.V. Club placed at the bottom of the tape. This shirt also comes in more than one color! You can purchase navy blue, black, light grey (where the lettering is red), and maroon. 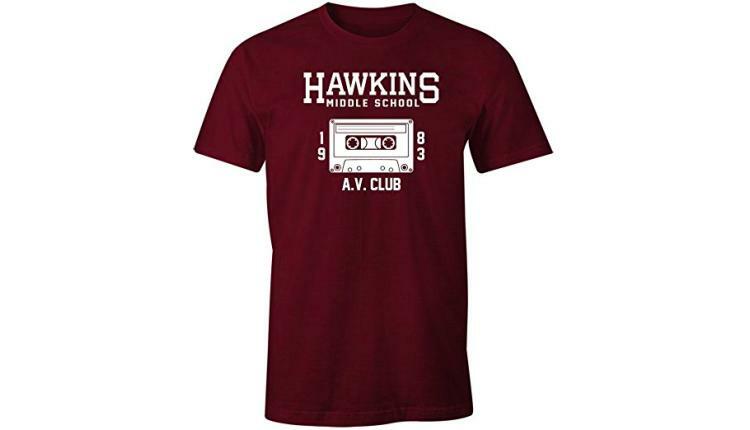 The Hawkins Middle School AV Club Shirt comes fairly priced as well, going for a range of $12.95 USD to $16.95 USD, depending on which size you decide on. 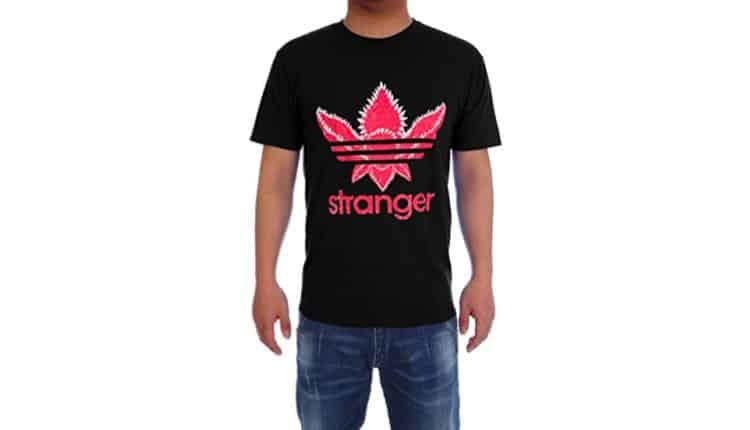 This Stranger Demogorgon Men’s T-shirt is made after the older Adidas logo. The head of the Demogorgon is made to look like the trefoil, with each petal of the mouth at the top more prominent than the fourth in the front. Through the Demogorgon’s head are the tell-tale three stripes that are so iconic to the Adidas logo, even the current one. Below the trefoil is the word “stranger” all in lowercase and in the same font as Adidas. The entire logo is in white and red. The shirt also comes in a variety of colors, including black, bright blue, grey, red, and white. Classic Adidas shirt colors, really. The price range for this one is $10.99 to $14.99 USD, and keep in mind that is runs small. As such, be sure to size up before you hit the buy button. 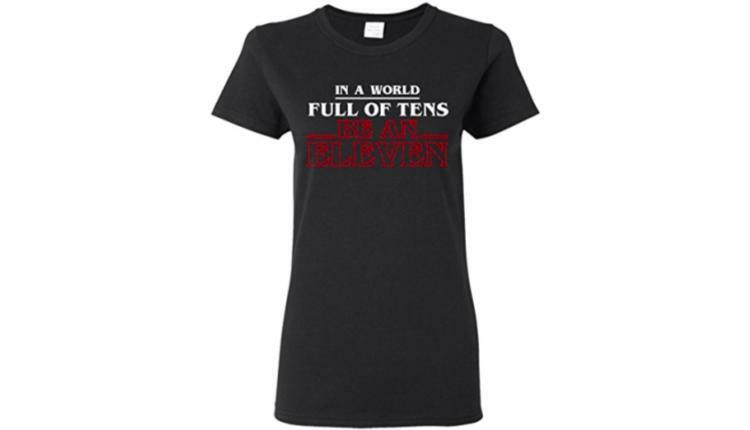 “In a world full of tens, be an eleven.” The sentiment is awesome, but we could do without all the torture poor El had to endure. 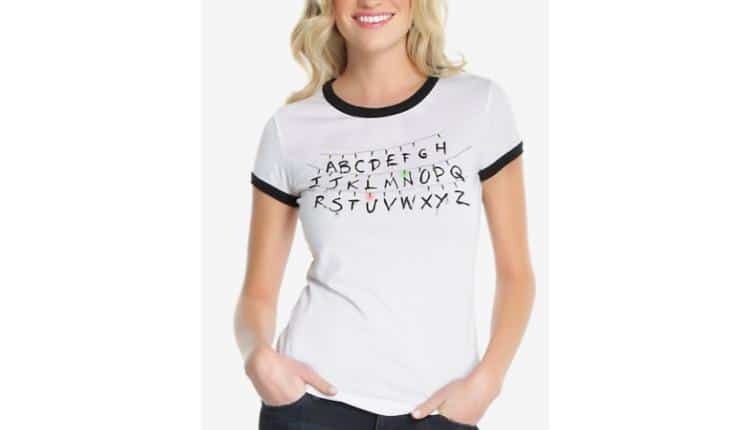 Even still, this shirt is fantastic to show your solidarity with our favorite Eggo-loving telekinetic while still remaining fairly minimalistic. This awesome tee by Nice Vibes Only comes in a black or navy blue base color, with the words emblazoned across the chest in white and the show’s signature title card red and font. This made-in-America shirt is available between SM and 3XL and is made from pre-shrunk cotton, so you don’t need to worry about it shrinking in the wash. That being said, however, reviews say that the shirt fits a bit small, so if in doubt, size up. One of the funniest lines from Season 1 was Hopper’s response to the Hawkins PD secretary, Florence. 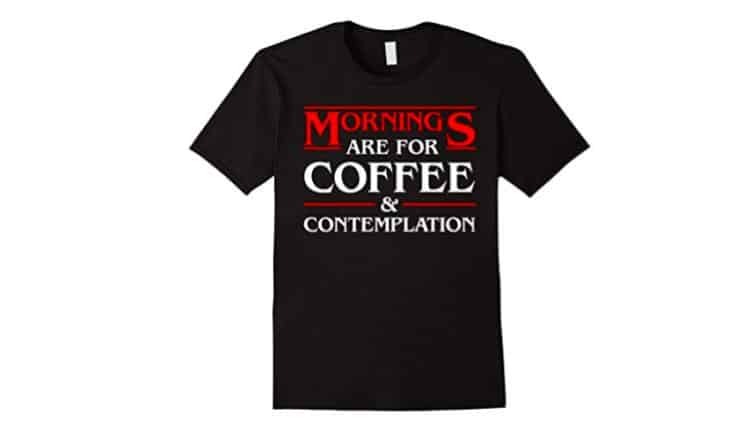 She was getting after him about Joyce Byers’ incessant phone calls, concerning her missing son, to which Hopper replied that mornings were for “coffee and contemplation.” We don’t know about you, but this is the cry of every non-morning person ever. Enjoy the morning’s contemplation in this versatile tee by Shin designs. The shirt is available in several base colors, including black, green, purple, and navy and royal blue. The text on the shirts appears in Stranger Things red font and white. The shirt is available in men’s, women’s, and junior cuts, and in a variety of sizes for each style. These shirts are 100% cotton, and washing instructions suggest cold water, so watch out for shrinkage! Wear your Stranger Things aesthetic on your shirt! This tee by TruffleShuffle features all sorts of iconic items from the series that’ll be sure to give you flashbacks to some pretty awesome moments. Some of the images on this boyfriend-fit women’s shirt include a bear trap, Dustin’s hat, Barb’s glasses, Steve’s bat, the Demogorgon miniature, and more! You’re sure to have all the feels, and maybe even inspired to re-watch both seasons. This distressed, oversized women’s tee is made from 100% pre-shrunk cotton and is available in sizes ranging between M to 2XL. The manufacturers suggest ordering a size down for a tighter fit, but if you’re looking for a comfy, slouchy look, then definitely order at par with your usual sizing. If there were any show that could inspire a comic book series, it’d be Stranger Things. Get a hint of what a comic version would look like with this graphic tee from Loot Crate. This black shirt is emblazoned with the Hawkins Middle School boys, Nancy, Jonathan, and Hopper in red. Behind them all looms the demogorgon in bright, vivid yellow. El stands between her friends and the demogorgon, in full color, protecting them all from the Upside Down. The shirt is made from 100% cotton and is available between sizes SM and 3XL. This shirt is a Loot Crate exclusive, which means you wouldn’t be able to find it from any other brand out there! It’s one of the best Stranger Things t-shirts Amazon has right now, so you’d better get it quick before it sells out. While looking for the Upside Down isn’t the most recommended course of action, it certainly seems to be a Hawkins staple. Any and all of our favorite characters have found the Upside Down one way or another. Now, you too can make the trip yourself, though much more safely, with this Stranger Things branded tee. This 100% cotton men’s shirt features a black base with a large circular image across the chest. The top half of the circle shows the silhouette of the Hawkins boys on their bikes amidst Mirkwood forest. Doubtless, they’re trying to find Will, but to no avail. Below them, on the bottom half of the circle, stands Will himself, so close and yet so far in the Upside Down. The shirt comes in sizes XS to 3XL, so there’s more than enough for everyone! This is our favorite Stranger Things upside down shirt on Amazon right now. Arguably one of Dustin’s better lines from Season 1, this women’s tee from TruffleShuffle says it all. Dustin screams this line during Season 1 Episode 6: The Monster after their fleeing schoolyard bullies. Eleven just saved Mike from taking a swan dive off the edge of a dam by holding him mid-air after he took the plunge. Needless to say, you don’t mess with Eleven’s friends, and these bullies learned that the hard way. This grey poly-cotton blend tee comes between XS and XL sizes. 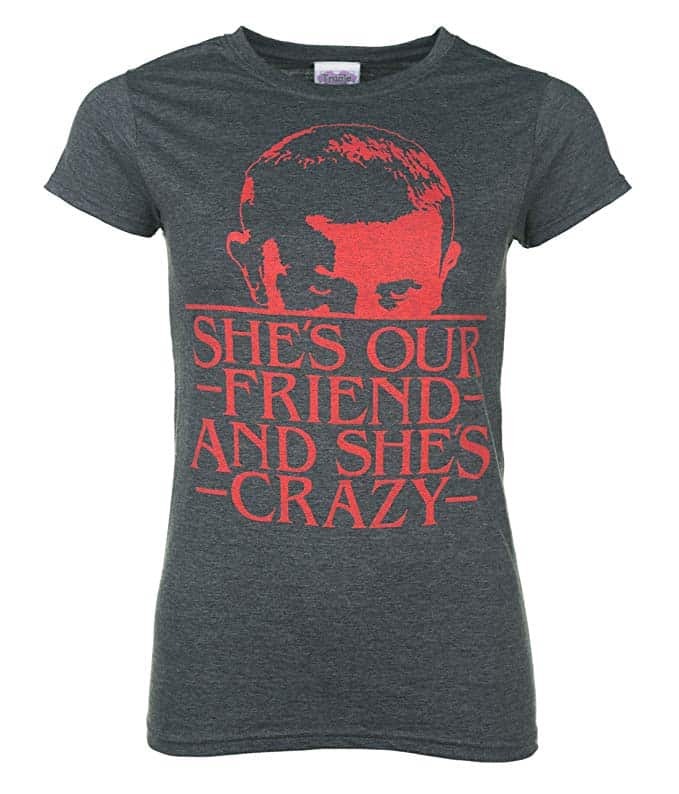 It features the text “She’s Our Friend and She’s Crazy!” in red, that’s meant to simulate the Stranger Things title card text. Eleven glares out from above the text, and trust us, you don’t want to be on the receiving end of that Look. Make sure to check the sizing chart so you can get the perfect fit of this awesome tee!